For Christmas, 'Doctor Who' Gets A Historic Change For fans of the long-running British sci-fi series, the Christmas episode is an annual tradition — this year's installment marks the end of Peter Capaldi's stint as the ancient, time-traveling alien. In this year's Christmas episode, the Twelfth Doctor, played by Peter Capaldi, meets his first incarnation — played here by David Bradley. It's time to say goodbye — and then hello again — to a TV legend. The BBC's long-running sci-fi series Doctor Who bid farewell to lead actor Peter Capaldi in the show's traditional Christmas episode, introducing a new star in the process and ushering in one of the biggest changes in the show's 54-year history. A lot of terrific performers have played the heroic, time-traveling alien known as the Doctor, but I think Capaldi might be the best of them. And he achieved this by making a brave choice, back when he first took on the role three years ago. His version of the Doctor, especially early on, focused on beating villains without worrying so much about collateral damage. There's a moment when the Doctor is stuck on a luxury train in outer space with a group of people and a monster who kills them one by one. Only the person about to die can see the monster, which makes the Doctor badger that person for details which might help defeat it. "This is probably the end for you," be barks. "But make it count! Details, please!" In another episode, The Doctor asked his trusty companion Clara a question few heroes ever ask: "Tell me, am I a good man?" Her full answer came later — "I don't know. But I think you try to be, and I think that's probably the point." During a press event at San Diego Comic Con this summer, I got to ask Capaldi for myself if the Doctor was a manipulative jerk, and he pushed back on the idea that the Doctor was simply hard-hearted. "When I grew up, Doctor Who was not a guy that you recognized. He wasn't a kind of avuncular uncle. He was a distant creature of mysterious power, and so in a way I wanted to go back to that." Doctor Who survives, in part, because of an innovative idea the show's producers had back in the 1960s. They called it regeneration — the Doctor morphs into a new person when he's near death, allowing the show to cast a new actor every so often. 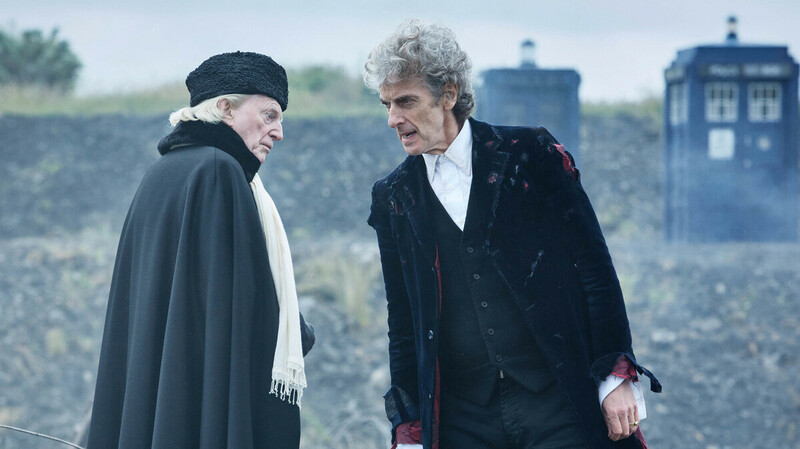 Now Capaldi has chosen to depart, saying goodbye in a special Christmas episode, Twice Upon a Time, in which his Doctor meets the very first version of the character. When I grew up, Doctor Who was not a guy that you recognized ... He was a distant creature of mysterious power, and so in a way I wanted to go back to that. The actor who played the original Doctor, William Hartnell, died in 1975. Producers cast Game of Thrones alum David Bradley, who is his spitting image. At age 75, he's also senior to the 59-year-old Capaldi — though the original Doctor doesn't quite see it that way when they meet. "I assumed I'd get ... younger," he says querulously. Capaldi shoots back: "I am younger!" Capaldi, who was a fan of the show as a kid, was exceptional even when the episodes he starred in weren't. He shifted the franchise from more romantic stories and offered a more inscrutable version of the character. The Christmas show also features a historic transition: Jodie Whittaker will take over as the new Doctor, the first woman to play the character. But let's take a moment, before then, to celebrate Peter Capaldi, a consummate actor who brought a fan's passion to one of the trickiest roles in television.